Recently I was able to enjoy a night at the Orlando Museum of Art and hear one of the most energetic and prolific Imagineers of our time- Mr. Joe Rohde. The museum offered an amazing spread of not only food from Animal Kingdom, including many small versions of things that could be found in Satu'li Canteen, but also music from the park, including the soundtrack of Avatar, as well as the harpist who typically plays in Discovery Island across from Flame Tree BBQ. There was a small exhibit where images from Joe's own sketchbooks were displayed, along with some artwork from around Animal Kingdom. Take a look below for some of the pictures from the exhibit. Brought to you by A.C.E. But the real heart of the night lay in hearing Joe speak about Pandora and Animal Kingdom. He had mentioned in a tweet that this would be an art history lecture, and let me tell you, that's exactly what this was. Now, being an art history nerd (I mean I spent a month in Florence, Italy just taking 1 art history class for no credit) I can tell you this excited me- not only would I get to hear an art history lecture, it would relate to my favorite park in Walt Disney World and it was to be presented by the man for whom I have the utmost respect and admiration. I will attempt to convey what his lecture was about and how it tied into the place that we know as Animal Kingdom! So, to jump right into it as Joe did himself, we discuss the fact that the way a theme park is planned and constructed is intentional and has numerous influences in the past, so that most of what has been constructed is not anything new, per se, but perhaps only done in a new way to suit a new purpose. First- we look at composition and how the layout of an area or scene plays an essential part in artwork. The artists playing a key role here are landscape architects, which draw some of their inspiration from artist Claude Lorrain. Lorrain shows the gently rolling hills and broadness of the landscape- landscape as more than just background-something with purpose. 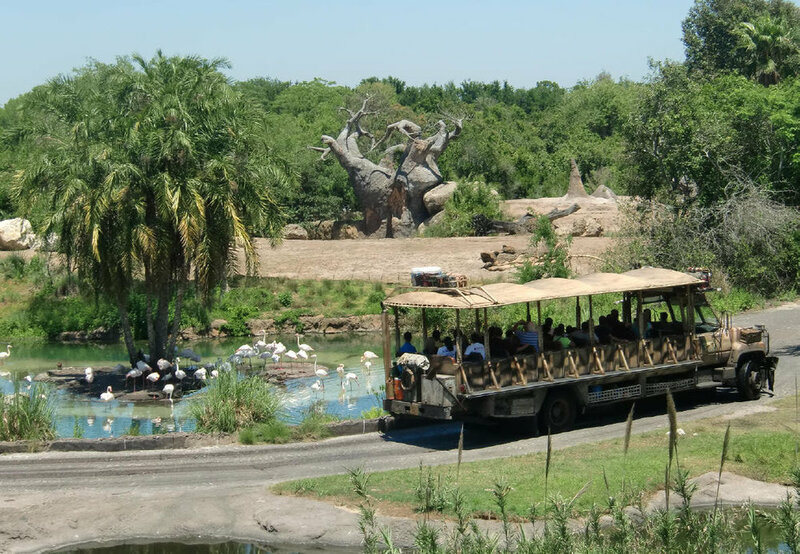 How does this tie into the park- just look at Kilimanjaro Safari and you can see that each slope and rock is placed in such a way as to be appealing to the eye whilst on a moving vehicle, but also functions in a way that ensures both animal and guest safety without obvious lines of viewer/viewee. Often during the ride, vehicles are not seen by the one behind, or at least you may only see the 1 or 2 ahead of you- particularly if you are out on the savanna. But again, the construction of the landscape has been shaped in such a way that the bend of the road helps hide the entire progress of the vehicles in front of yours. And each aspect of this constructed landscape must be placed in such a way that it looks good not only to the vehicle that passes it on the left, but also the one that is passing it on the right and the entire way around. This is where Charles Bridgman takes his part. He made the Stowe Garden- an English landscape garden where the hills, valleys, and even the very trees were placed in such a way as to be appropriate to the design. Creating places also means creating spaces, which leads to architecture, which has been called the highest form of art as it incorporates a multitude of different art forms into one- sculpture, color, design, movement in space- all come together to create something that is functional yet beautiful at the same time. When landscape artists build, particularly in Animal Kingdom, and create something out of nothing, we can look at no better beauty that Mt. Everest- home of Expedition Everest. However, for many years, the mountain was a place that inspired fear and reverence. It wasn't until the 1780's and Caspar David Friedrich where we begin having the mountain seen as a mountain of aspiration- representing an idea- a positive symbol of what we aspire to. Everest is very much this invented idea, a crafted idea which stems from the Romantic era, the Picturesque era where the mountain can do more than just invoke terror of the unknown. If we leave the mountain and start to look at the world around us, we see that currently there is much going on- which is no better time for artists to do what they do best- create! We find this if we wonder into Africa in Animal Kingdom, as many of the fabricated artwork here is influenced by someone in particular who showed how to turn what some would consider junk into art. The idea of things happening in a world of economic pressure, where the focus is on conservation, and where the Imagineers have filtered this world through a lens of brightness and deliberate design- this is Africa in Animal Kingdom and the filter is Robert Rauschenberg. His work of combining elements of refuse and making art out of these elements inspired many corners of Africa, from the posters hanging on the walls to the bicycle wheels that adorn the light posts. Take a look in Tiffins and you will see a Rauschenberg inspired piece hanging on the wall- while it may seem odd to have this canvas covered in wires hanging in a signature restaraunt, it demonstrates the influence of this artist on an entire land in the park. Another influencer in the upcycling of materials into art is that of El Anatsui. We may love the new lion marquee outside of the Lion King theater, but we would not have this without El Anatsui's influence. Here, in Harambe, we see that trash can become more valuable than trash and there is a culture- both fabricated in the park and reflective of real life- where the useless becomes useful and art can be made from anything. Now, while we discuss how trash and useless things can be turned into new things, we must also acknowledge that the park is replete with many things that look old. And, while it's a very cool aesthetic to have old things in the park, sometimes ruins and broken objects can seem very depressing and sad. Where does one turn to and find that ruination can be crafted to not be depressing and just crumbling facades? Hubert Robert painted many ruins where the feeling of broken but beautiful is clearly demonstrated in the crumbling buildings in his paintings. The imagineers then bring in this idea and show that there is the power of nature absorbing human effort, but still remaining beautiful and giving us a documentarian look at what has happened but through an aesthetic filter. Now we go into the story behind the things we view- the story that every object that is placed has to tell the viewer if one only looks carefully. This allows the imagineer to make art by following the rules of art, yet provide just a touch more for those who will view this art while waiting on line to experience an attraction or sitting to eat a meal. We look to William Gilpin to see that things can be edifying to look at- that they are not just objects- that they are purposeful, beautiful, and intentional. We also turn to Thomas Cole to see that landscape can be meant to say things- to speak to the viewer. Cole's work offers landscapes that are imbued with spiritual messages- conveyed by light- and are meant to truly mean things. And finally we look to Fredric Edwin Church to show us the vastness of a painting and what experiencing this size and scale can do to a viewer. Church's paintings were often displayed in a theater and were typically shown one at a time as they were so large- thus awing the audience with both size and detail all at once. The message culminates to: Slow down, take your time, and you will be rewarded with the details in inspection. This leads us to Pandora. Our lead imagineer, the one who spent 6 years from concept to opening day, told us that Pandora is the most artificial and profoundly plastic landscape. While this gave everyone a good chuckle, it's also very accurate. There is little on Pandora (from the film) that would be recognizable to a human. So how do you take this insanely mythical place and create a space for people to walk around and truly feel as if they have been transported to such a space without alienating them with all fake objects surrounding them? The first thing that they did was find an object to instill awe into the viewer and create a space where vastness and small detail play hand in hand. The center of this space is the floating mountains. The floating mountains were constructed out of steel and concrete, two materials that do not exactly exude the feel of weightlessness and airiness. How does one achieve such feelings from such heavy and weighty materials? 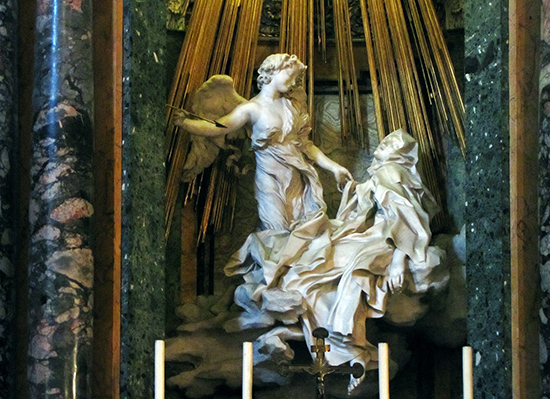 We don't need to look anywhere but to the Italian sculptor Gian Lorenzo Bernini. He created my favorite David and, as you can see from the images, turned marble into cloth and imbued the muscles with movement and poise. The additional inspiration for the floating mountains can be found in places where one is meant to look up and draw inspiration from the beauty- churches- in particular the Gothic style of church. The Gothic style celebrates light and bringing in the "light of God" into a physical space but drawing the eye up towards the heavens by use of columns. In order to draw the eye up, ribbed columns were implemented, which are lighter and thinner than the heaviness of the Romanesque bulky columns as the flying buttresses on the outside of the churches alleviated the need for the internal columns to be weight bearing and could now achieve that light, airy feel. Additionally, these churches let in as much light as possible via stained glass windows and even an oculus near the altar of the church. The play of light and shadow is also a key element when your "church" is outside. Here, the mountains are influenced by Giovanni Battista Gaulli, who showed that the eye can be tricked to see what it believes is there and not necessarily what is actually there. Also, Piranesi has a heavy influence in the combination of light and shadow and the details going on even to the most remote corner of the piece. So we see through the combination of light and shadow, as well as leading the eye towards the heavens, the floating mountains are sublime- instilling awe and a safe fear in the viewer. Another place where these themes come together, where the guest is able to have a moment of epiphany, celebration, where everything turns good, is during the Flight of Passage attraction. If you have not been on this attraction, I will not spoil it but will try to be as specific and vague as possible. There is one moment during the thrill of the attraction where the pace is slowed and the viewer is able to breathe and have this moment of amaze. And the influence for the design of this space is clearly the Gothic style church. Now, I do not have the exact name of the church that influenced the attraction (Joe's picture was spot on) but here is a type of Gothic church where you can how the influence was translated into the attraction. The columns are a very similar design to the area in the attraction where there is the pause. So, just as patrons back in the High and Late Middle Ages were invited into the church to pause at the beauty of the Lord, so is the guest invited to pause and absorb the beauty around them during this portion of the attraction. Before heading out of Flight of Passage, we need to take a look at the queue for this attraction- easily one of the most magnificent and memorable queues in quite some time for Walt Disney World. Here, when guests enter the floating mountains, they are surrounded by a most primitive form of art- cave paintings. Now, the influence here is clear if you open most art history books (and look at the pictures below) but the imagineers were able to do what the men of the caves could not- they were able to ensure that the layout of the cave rock provided the shape they needed so they could, oh I don't know, say paint a huge banshee to encompass 3/4 of a wall. It should also be noted how the braided sculptures seen throughout the land were not fabricated on what was seen, but actually made by people adept at this weaving tradition. The Javi textile artists (I'm unsure of the spelling but this is how he pronounced it) were the ones who actually wove the pieces you see throughout Pandora. As Joe said, why should they recreate the wheel when these artists have been doing it for so long? Just take a look at the detail in the pictures and you can see, there is just no comparison to true artistry at work. We cannot mention Pandora without considering how this place takes the ideas of conservation and nature and presenting them to the viewer in a softened way. Again, we see the decay of the "great works of man" and the reclaiming of these objects by the force that is nature; however, we are not depressed by this reclaiming. In Pandora, the artists have filtered this process which could be depressing under the lens of Hubert Robert and Theodore Rousseau and romanticism, as discussed above, and are now showing that the "fantastically aggressive works of man" are succumbing to the forces of nature. And finally, we cannot leave Pandora without talking about the nighttime spectacular that is the bioluminescence and the influence for some of these plants. We see the influence of Dale Chihuly in his glass sculpture in the giant plants that grace the night. To close the lecture, Joe discussed how John Ruskin, in his book The Stones of Venice (1851), indicated how it was inevitable that we, as people, pursue our future to living in cities. We have seen that this migration towards cities has been the trend since Ruskin's time. Now, we must look at how these cities are developed and maintained as, particularly for older cities, they were not developed with the idea of beauty and meaning. While cities must tackle the difficulty of containing the density of the population, they could also be places of narrative, meaning, beauty, symbolism, and safety. The ideas that have been placed in the theme parks, where they are both a functioning place for a massive audience, as well as a place that offers beauty and form, must be now utilized to make our outside world just as pleasant a place to be as the theme parks we come to in order to escape real life are. And on that note, my friends, is where Joe ended, and so shall I.